Thoughts on the global game, usually from a tactical view. Mario Balotelli: Why wasn’t it you? There were seven Manchester United players in the box. Mario Balotelli stood casually ten yards Southwest of the penalty spot waiting for the ball to be crossed to him. James Milner made the run and then delivered what Mario wanted. As it came towards him he moved forward, fixing his eyes squarely on his prey. The ball rolled across him, he then rolled his leg back, pointed his toes to the right and hit the ball with the side of his foot, precisely into the far corner of the net. After 21 minutes and 21 seconds, the 21-year-old had given Manchester City the lead at Old Trafford. You can be easily forgiven for not remembering the goal, after all, many of those at Old Trafford that day lost it in their memory banks the moment the goalscorer pulled his shirt up to reveal the now famous ‘Why Always Me?’ message underneath. Balotelli would go on to add another goal in the 6-1 rout by City, netting goals number five and six on the season in just his sixth game. The next day Balotelli was the footballer the world talked about. The millions of young fans who loved him for his brash, no-nonsense attitude chased down the thousands who questioned his every move. The minority lay quiet admiring what they had seen and wondering what his next move would be. In his Champions League debut against Villarreal he scored a penalty and gained more fans with his now trademark stare-down celebration. Then came a substitute appearance at Liverpool where each of his weaknesses came to light in an 18-minute cameo appearance. Asked to play on the left of a front three, the Italian simply couldn’t defend his flank, struggled to hold the ball up in deep positions far away from the goal, lost his temperament and committed two stupid mistakes to get booked and then sent off. The majority of his fans screamed he was the victim but the minority knew it was a fruitless argument. A goal with his shoulder on the line against Norwich was laughed at by his adoring followers while others were appalled at the level of showboating in a 5-1 game. Then came a game against Tottenham when his manager Roberto Mancini gave him another shot to make a difference with another second half substitute appearance. Balotelli would go on to show tremendous composure, brilliantly scoring a penalty with the last kick of the match to win the game but, typically, the match would be remembered for his stamp on Scott Parker, missed by the referee, for which he would later get suspended four games for. Upon his return he’d help City fightback from 3-1 down against Sunderland in a crucial home match but he fueled the non-believers again by pushing his skipper Vincent Kompany when arguing with team-mate Aleksandar Kolarov over the taking of a free kick. At Arsenal in April, less than six months after his world class showing at Old Trafford, his stomp on Alex Song went unseen by the officials but his pathetic performance and overall poor attitude was seen by most. Mancini, for whatever reason, left him on for 90 minutes, before the forward lost his cool again and was handed his fourth red card of the season. As Manchester City’s season obituary was being written across all the papers in the land, Balotelli’s backers distanced themselves. The minority were becoming the majority. The game of football was more forgiving. With many expecting Balotelli to be given as much as a nine game ban and City to be firmly out of the title race, the sport answered back, giving him one last act of the season, as he supplied the pass for Sergio Aguero’s kick heard all around the world that won City their first title in 44 years. The beautiful game had given Balotelli exactly what he needed in his hour of need. Despite being shunned, mistreated and being felt that he didn’t even like it, the game embraced Balotelli that afternoon in the hope he’d fall in love with it all over again. Just over eight months on, and fifteen months after his Old Trafford brace, Balotelli’s time in England appears to have come to an end. ‘Why Always Me?’ took on a life of its own in late October of 2011 and it now represents the peak of Balotelli’s time in the Premier League and a stark reminder of what he could have become. Since then he has scored 14 goals in 47 matches for Manchester City, starting and finishing just 11 of them. Stats that tell the story of an average player with an average strike rate. Balotelli was supposed to be better. He represented the youth of today who embraced cool and had the swagger, charisma and, most importantly, the talent to be the league’s greatest maverick since Eric Cantona, the Frenchman who also divided opinions but regularly performed at a high level for his club the moment the game started. In those rare moments of brilliance, Balotelli seemed ready for the Premier League and through his struggles, the Premier League, 20 years on from its birth, seemed ready for him. In its early years it didn’t get along with Italians, the likes of Andrea Silenzi and Massimo Taibi departing as quickly as they came, but Chelsea’s triumphant trio made Italy cool again in the 90s and in the wake of recent busts such as Alberto Aquilani and Andrea Dossena, Balotelli had the chance to pave a path of gold fellow Italians could confidently stride down for years to come. Somewhere along the way, the game, the only thing left that could, humbled Mario Balotelli. As he moves on to a new part in his footballing career the man who teased us with the moments that once made the vocal majority go wild needs to give back what he has been given. A supreme athlete with incredible strength, a gifted eye for goal and a fearless attitude in front of the net, the Italian, still only 22, could still be great, but his two-and-a-half years in England will go down as a massive missed opportunity for him, the league and the sport itself. Oh what could have been, Mario. 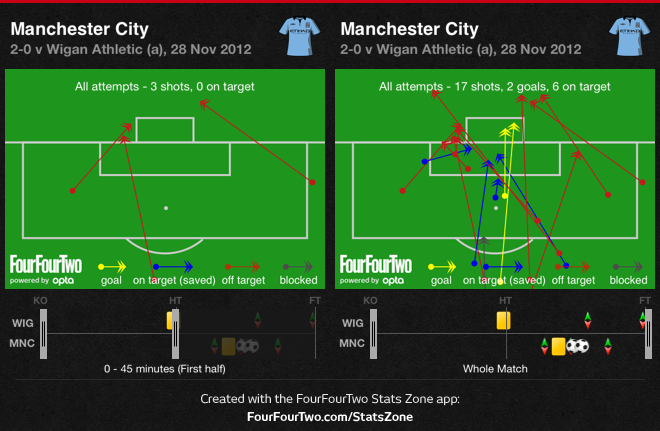 Wigan Athletic 0-2 Manchester City – Mancini’s tactical changes make the difference. After a recent Champions League loss, Manchester City defender Micah Richards declared in the heat of the moment that his side were not comfortable playing in a back three. Later, manager Roberto Mancini said he wanted his side to be comfortable playing in any system he requires of them. On this cool night in Wigan that was put to the test and the players passed with flying colours. Mancini may have won a title with this side and is coming up to his third anniversary in charge of City, yet it is clear he isn’t a manager who is content with one formation. He did, after all, go with a back three in the Community Shield just a few weeks after the club lifted their first top flight title in 44 years. While most managers find a system that they like and usually stick with it, the Italian has became a obsessed with the rotation of systems throughout games. Nowhere else is this more evident than in central midfield. In the six league away games, prior to this, he’s picked two holders three times and one holder three times from the start. He’s ended with two holders four times and no holders twice. At Wigan he opted for two holders in Javi Garcia and Gareth Barry with Yaya Toure pushed further forward. Maicon and Mario Balotelli also returned alongside Garcia who started his first match in almost two months. The decision was a boost to those who feel Toure needs to be higher up the pitch but the experiment lasted 45 minutes and didn’t work. Toure spent the majority of the first half pressing Wigan’s back three but when City were in possession he was almost in David Silva’s way in an attacking sense as the Spaniard loves to roam vertically and have a free role. Against a natural two in central midfield, with a back three, it made sense to eliminate one central midfielder, go man-to-man, and push a man forward and try to create a 4-on-3 when Wigan’s wide players were advanced. At the start of the second half he went to a 4-4-1-1. Fifteen minutes after that, Mancini had seen enough from Garcia who was regularly being outrun in midfield. Barry was placed back centrally with Toure and James Milner was brought on to play wide right. This pushed Sergio Aguero central and closer to Silva who was now impacting the game a lot more. Less than a minute later Mancini was made to look like a genius, when Ali Al-Habsi spilled a ball and allowed Mario Balotelli to pounce. 1-0. Two minutes later it was 2-0 and game over when Milner sent in a rocket of a shot past Al-Habsi. Both goals came from wide areas. The first via Milner on the right stretching Wigan’s back five, leaving space in the middle for Silva to run into and supply Barry whose shot was spilled by Al-Habsi. The second one came via the excellent Kolarov whose cross to Silva, drew in FIVE Wigan players, before the Spaniard laid it off for Milner to finish the game off. This was probably City’s most complete away performance of the season, yet it was far from perfect. In their opening 45 minutes they were again too narrow and didn’t get service to Balotelli. However, as the game went on the tactical changes brought the best out of their players, stretched Wigan and led to a barrage of chances on Al-Habsi’s goal. Mancini has quietly assembled a squad of versatile players who can play in different areas and even in this game when Milner left injured he was able to use Mr Versatile himself, Pablo Zabaleta, in central midfield and bring on Kolo Toure to play in a back three. The biggest problem Mancini continues to wrestle with is width and when to use it. It was natural to try and go narrow and win the game down the middle against Wigan but the moment he stretched his team later in the game he found that his players were able to prevent the Latics from creating overlaps themselves. It is clear that City continue to struggle to open up teams away from home but as the game goes on, spaces develop and their opponents tire, as evidence in the amount of first half goals scored compared to second half goals this season (2 to 7). What is still to be determined is whether Mancini’s changes regularly cause this or benefit only when their opponents lose their shape. Games at Fulham and West Brom, for example, were difficult to pinpoint. However, on this night it was clear this victory was on the manager who noticed the changes and reacted accordingly. World Cup Tonight Day 12 & 13 – Formation Geek destroys France. 2010 World Cup Tonight Episodes One & Two. Blog at WordPress.com. | The iTheme2 Theme.